Why You Should Have the Latest Version of WordPress Installed? Why it is Important to Update Your Current WordPress Version? WordPress often comes up with the updates that include many fixes and maintenance. But, everyone gets this question and even we received some comments and emails asking whether to update the WordPress or not. Is it safe for the website? So, here is the article that will answer this frequently asked question. WordPress is free and cool to use. More than 30 million online users uses WordPress for their website. And, thus WordPress always comes up with the update. It’s every update consists of bug fixes, new features, improved performances, and improved performance of existing features to sustain their industry standards. Hence, the straight answer is you must update WordPress as soon as an update gets broadcast. Ironically, if you are not updating it, you are endangering your website’s security and latest enhancements and features. Let me take you deeply by giving short briefs about each and every point of WordPress updates. Every new update of WordPress comes with newest features. Whether its for improved plugin install experience, or quicker plugin updates. Every update gives something or the other improvements to better assessments. 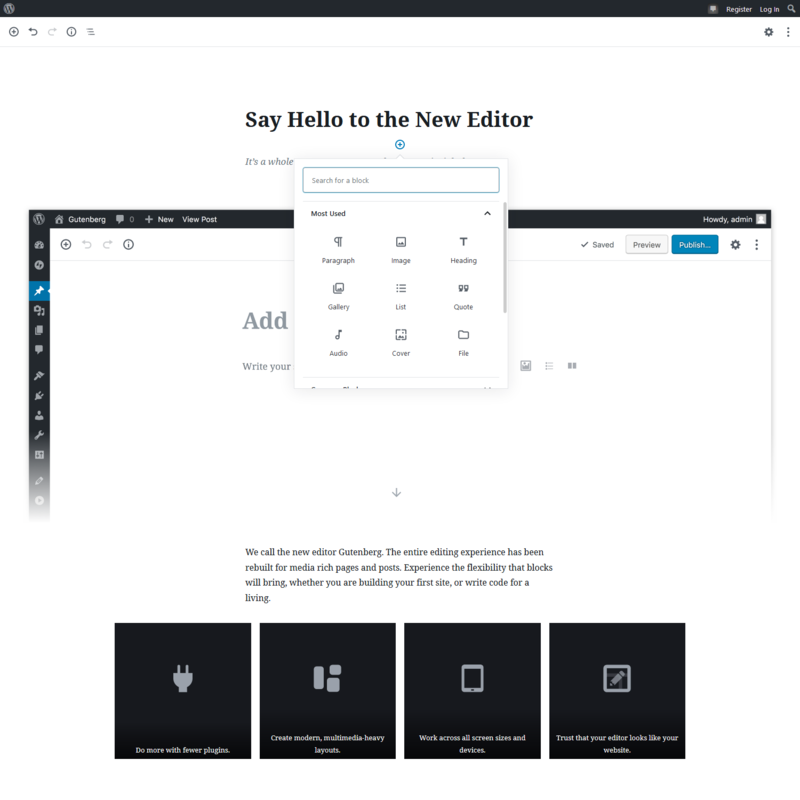 The latest Version 5.0 of WordPress, named “Gutenberg” is a completely new editor. You will experience the blocks everywhere for media rich pages and posts. While Version 4.9 “Tipton” of WordPress released with major customizer improvements, code error checking, and more! Security is one of the most important points on this list and WordPress generally works on security of its and yours website. No one should loose anything. Almost 58% of websites are powered by WordPress today and due to this much of popularity it is also the primary target for hackers. As we all know, WordPress is an open source, anyone can study the source code to learn and even to improve it, that’s also applied to hackers. Hackers can easily search for websites that runs on the older version and if your website is one of not updated then, you can be a victim too. But, there are some good hackers too who finds the bugs for WordPress and fix that. And, then it forward the bug fixes in updates. Now, you know why fixing bugs is important. And, not just WordPress, plugins can also be tapped by hackers. You have to make sure that all your WordPress plugins, and WordPress Themes always up to date. The developers of WordPress always try to make things quicker and faster for everyone. Every new updates comes with many performance improvements that makes WordPress run faster and effective. SEO has taken speed as a really huge factor and hence WordPress always tries to make it as SEO friendly as possible. There are many things in the way a website or WordPress to be precise, face bugs issues. A bug not only effects your website completely and also makes it slow as hell. Every new WordPress update is released with many bug issues solved that can certainly work well for your website. Compatibility is also another giant reason for upgrading the websites with new update. The compatibility focuses on how WordPress works with different bunch of browsers, plugins, themes etc. Hence, updating your WordPress website with latest version will be an advantage for you and your website. So, here are the major 5 points that shows you how much it is important to update your WordPress version or website. Always try to keep your WordPress, and plugins up to date and never miss an update.